Scattered through histories of Miller Beach and Northwest Indiana are references to the Miller post office and Miller postmasters. 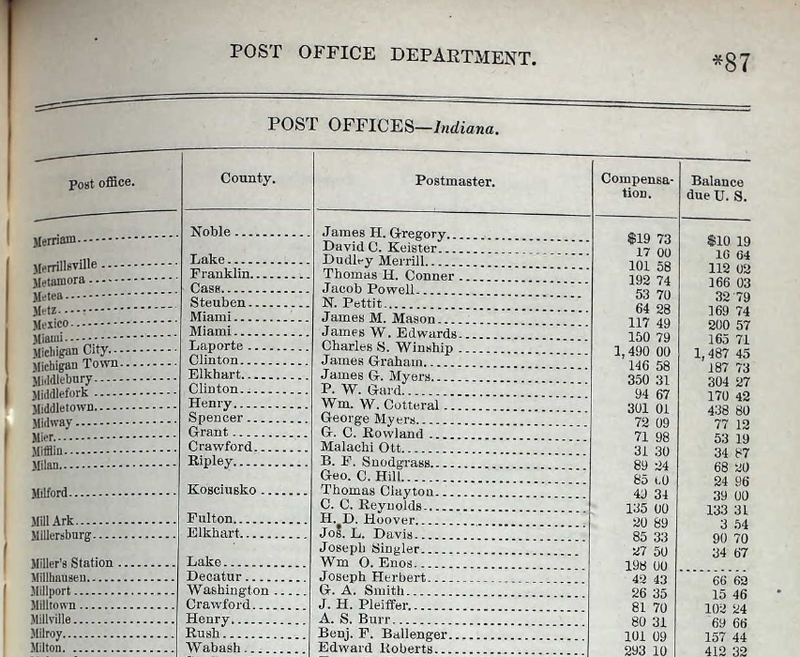 This article, using U.S. Post Office records and Gary City Directories, complies the information into one place. It also includes a section on street names which were changed sometime between 1922 and 1923. 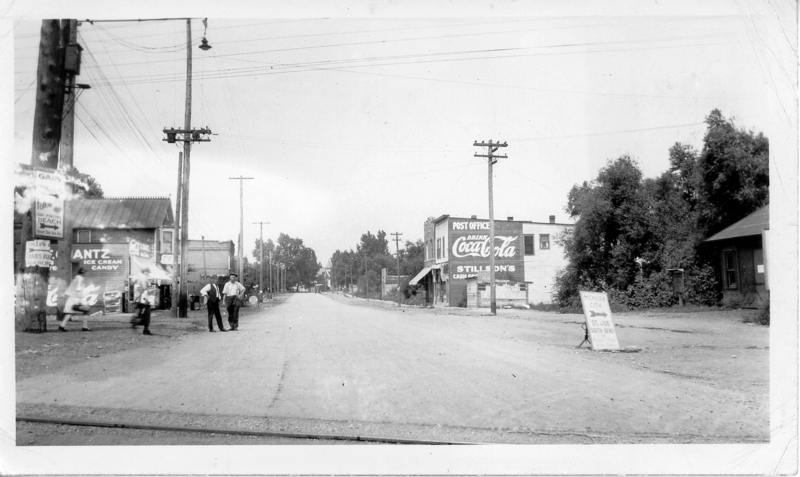 The first five years of the 1920s were an exciting time in the newly annexed town of Miller: Marquette Park was built, telephone service was established, Gay Mill Gardens was built and operating at full tilt, and the population was rapidly expanding onto new streets north and east of "old town" Miller. All that was changed by an enterprising William O. Enos who was paid $198.00 (Footnote: Department of Commerce and Labor, Bureau of the Census. Official Register of the United States, Containing a List of the Officers and Employees in the Civil, Military, and Naval Service. Digitized books (77 volumes). Online at Ancestry.com to 1913 for postal service. ) 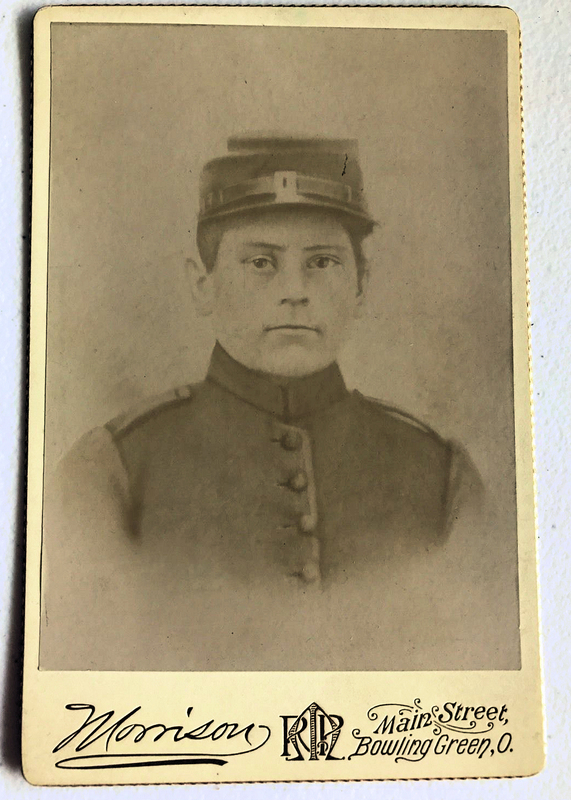 as the first postmaster of Miller's Station. 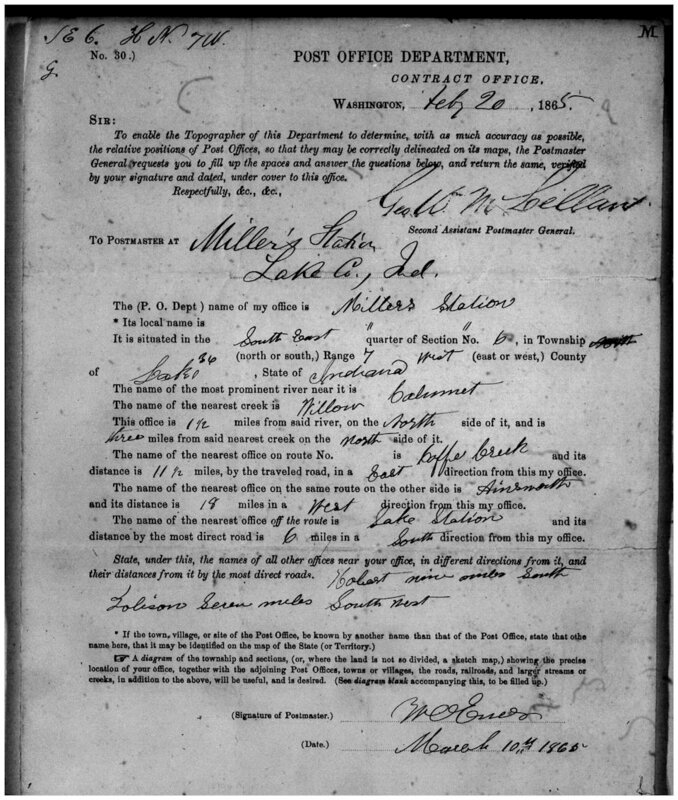 The 1865 Post Office Contract signed by W.O. Enos, locates the office 1½ miles north of the Calumet River (the Little Calumet), and 3 miles north of Willow Creek. On the same postal route, which is not numbered in 1865, is the office at Coffee creek, 11 ½ miles east, and Ainsworth, 18 miles west. (Footnote: This is either a mistake or name change. In 1863 there was no postmaster for Ainsworth which is due south about 8 miles. There was a postmaster at Brunswick, about 18 miles southwest. ) The nearest office off the route is Lake Station, 6 miles south. (Footnote: Using the “measure distance” feature on Google maps this places the location of the Miller Post office right about at the intersection of, today, Miller Ave and Lake Street. ) The rail carrier is not identified on the contract: the Baltimore and Ohio did not come through Miller until 1874 so it must have been the Lake Shore and Michigan Southern. There is no reason to suppose it moved from that location. Unfortunately the location map what was to have accompanied the contract did not survive, but it would have not shown a very detailed location judging from the one that was filed in 1909. The picture of the post office has "First Post Office in Lake County, Miller, Indiana" written on it. It is likely splitting hairs, but it may well have been the first structure built as a post office. Local legend maintains the post office was in a house on East Sixth Place in Miller, and there is no reason to suppose that it was not used on occasion that way during the “North era” from 1901 to 1919. In 1910 John North, his daughters, including Emma, lived on Center Street, now E. 6th Place. He remained there until his death in 1944, living with his daughter and her husband William Carroll. In 1926 the Times reported that “In the hope of obtaining direct mail service through the Gary post office department, Miller residents are petitioning for the abolishment of the Miller post office which has been in existence since 1869 (sic).” (Footnote: The Lake County Times (Hammond Times), June 14, 1926, page 5. ) Miller Station was then a sub-station from 1927 on. It stayed in the block between Miller Ave and 6th Place until World War Two, in Minnie Todd’s confectionery at 641 Lake Street for a decade between 1927 and 1937 before moving back to 617 Lake Street, Stillson’s grocery. By 1945 it had moved north and across the street to 436 Lake Street and then into a new home, a new building at 419 Lake Street. (Footnote: If you are old enough you may remember this building as the home of Luigi's Pizza. It was also used as a banquet hall and housed Thompson Catering at some point. (The signs are hanging off the building.) ) Evidently too small for a growing Miller, it was replaced with the current sub-station on Hancock Street in 1962. Below is a complete listing of the locations as derived, after 1925 from the city directories, of the post office locations. 1865 – to 1909 – the “hen coop”. 1909-1925 Possibly several locations: North residence, Stillson’s at 617 Lake Street, and/or on the east side of Lake Street between E. 6th Place (Center) and Miller Ave. where it would be in 1925 to 1937. 1925 – 637 Lake Street (between Miller Ave and E.6th place). 1927 – 641 Lake Street (between Miller Ave and E. 6th Place next to the Miller Hdw & Paint & Jungheim’s confectionary. 1929 – 641 Lake Street – now a branch of the P.O. in Minnie Todd’s confectionary. 1930 – 641 Lake Street. 1935 – 641 Lake Street. 1937 – 617 Lake Street (Stillson’s grocery between Sixth Ave. and Miller Ave. across from the B&O passenger station at 618 Lake Street. 1939 – 617 Lake Street (Stillson’s). 1941 – 617 Lake Street (Stillson’s). 1945 – 436 Lake Street (Miller Food Shops – between Fourth and Fifth Ave). To 1962 when the current location on Hancock was opened. William Enos, the first postmaster, was followed by Henry Noe, neither of whom stayed around Miller. From 1871 to 1919 the position was in the hands of three people, or families. 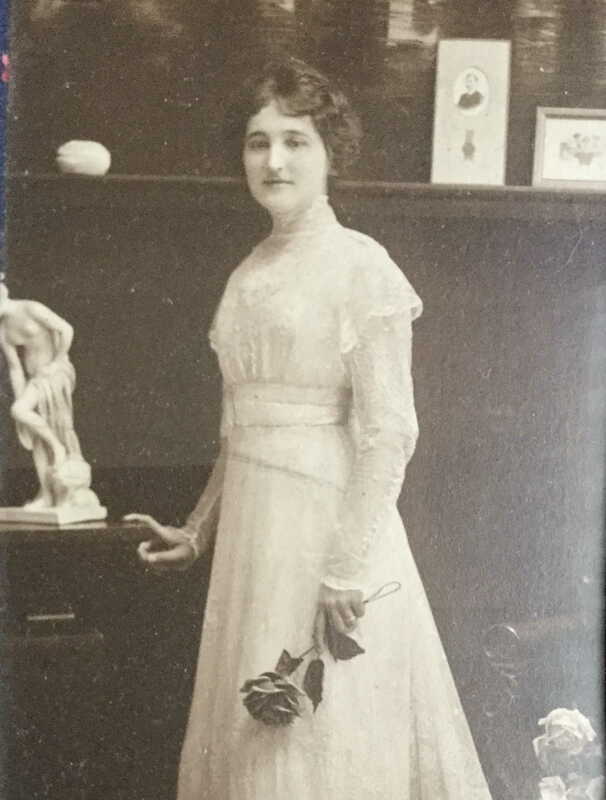 William George Cook was a telegraph operator who served eight three-year terms, James Ansbro three terms, then John North served one term and was succeeded by his daughters Emma and Marie. While is sometimes popular to call women postmasters “postmistresses,” the U.S. Postal Service’s official title for women has always been “postmaster.” (Footnote: For more about women postmasters see a USPS article on women postmasters. ) Cook, who married into the Miller Nelson family, had five sons, only one of whom stayed around Miller. 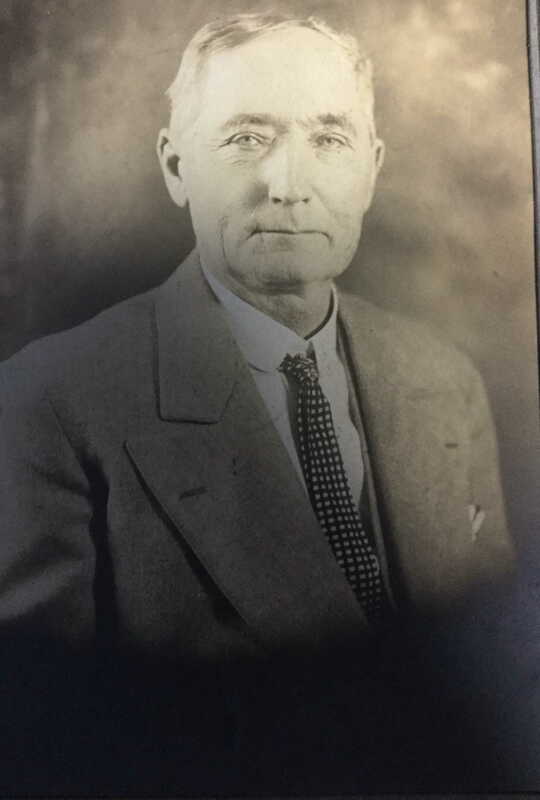 James Hughes Ansbro, who owned the fifteen acres bounded by Miller Ave, 5th Avenue, and Lake Street, was to leave a huge legacy on Miller through his daughters. The same could be said for John North, who was at times a Miller trustee, living to the age of 95. Below are pictures of Miller's principal postmasters in the early years. William George Cook (1842-1897) served eight three year terms. Photo from Cook's Find-a-Grave site: Tim Beckman. 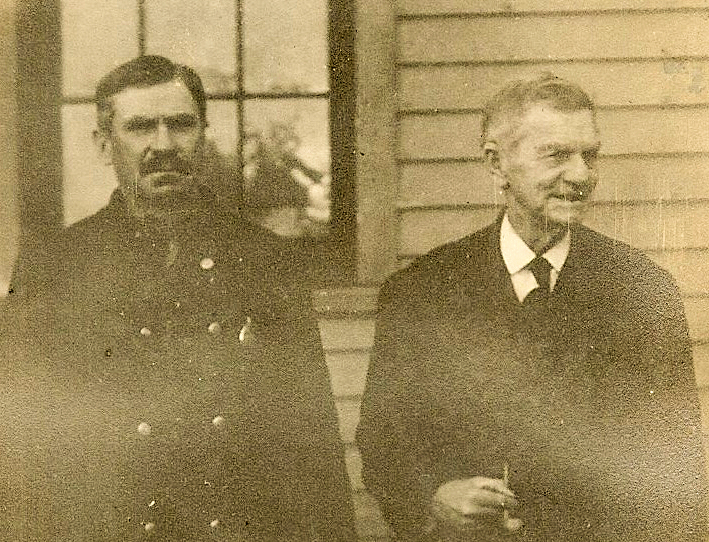 While it is not absolutely confirmed, the older man on the right is likely James Hughes Ansbro (1829-1915) with his son-in-law Michael Stack. Photo courtesy Patrick Ryan, J.H. Ansbro's GG Grandson. Photos of John North and Emma courtesy Tanis Carroll Pawson, Emma's granddaughter. Cook would have had to deal with the hubbub of the name change. When the Baltimore and Ohio railroad was built through Miller in 1875 Commodore Vanderbilt, who owned the Lake Shore and Michigan Southern, by then a subsidiary line of his New York Central, had the name of the post office changed from Miller to Vanderbilt, probably to spite his chief competitor. It was changed back in 1879. 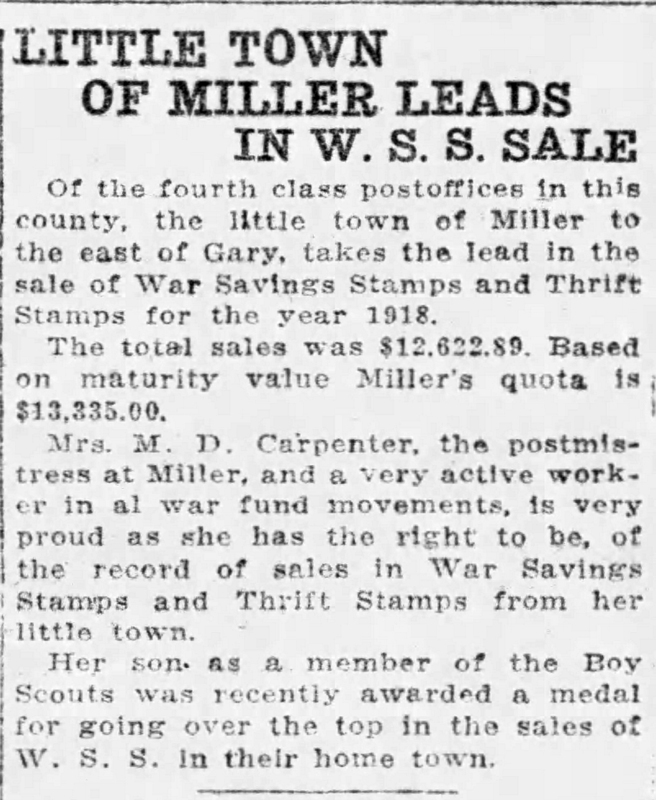 During the “Great War,” the little Miller post office earned a distinction as being the leading fourth-class post office in the country to sell War Savings Stamps for the year 1918. (Footnote: The Times, February 6, 1919, page 11. 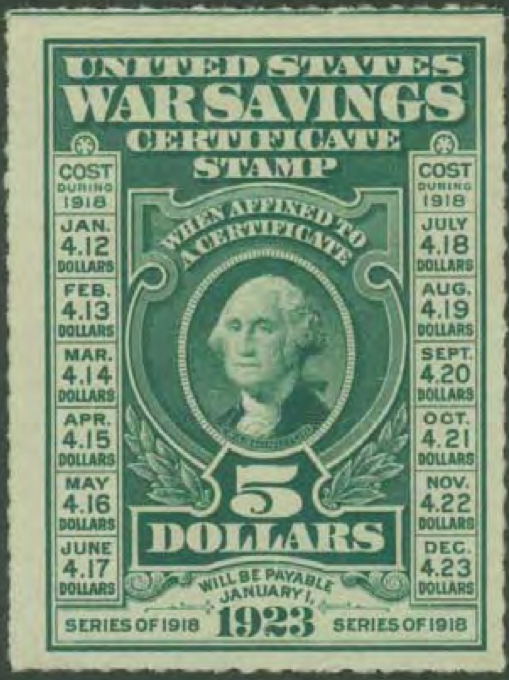 For more about the War Savings Stamps see "Postal and Treasury Savings Stamp Systems: The War Years" at the Smithsonian's National Postal Museum website.) 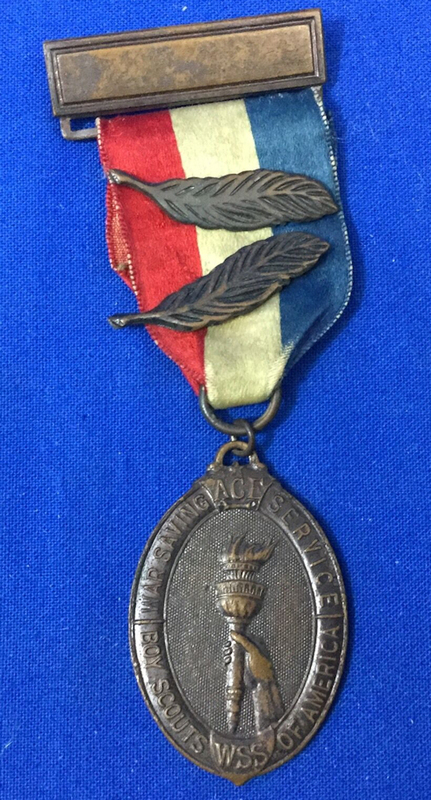 The postmaster, Marie Carpenter, John North’s daughter, no doubt had the help of her son George who won a Boy Scout medal for his efforts. There are two sources online for postmasters, both available at Ancestry.com. One is the Register of Civil, Military, and Naval Service, 1863-1959, printed every two years, includes how much they were paid for the two-year period. The pay register for the Postal Service at Ancestry only goes to 1911. The other record is the actual handwritten record of appointments. 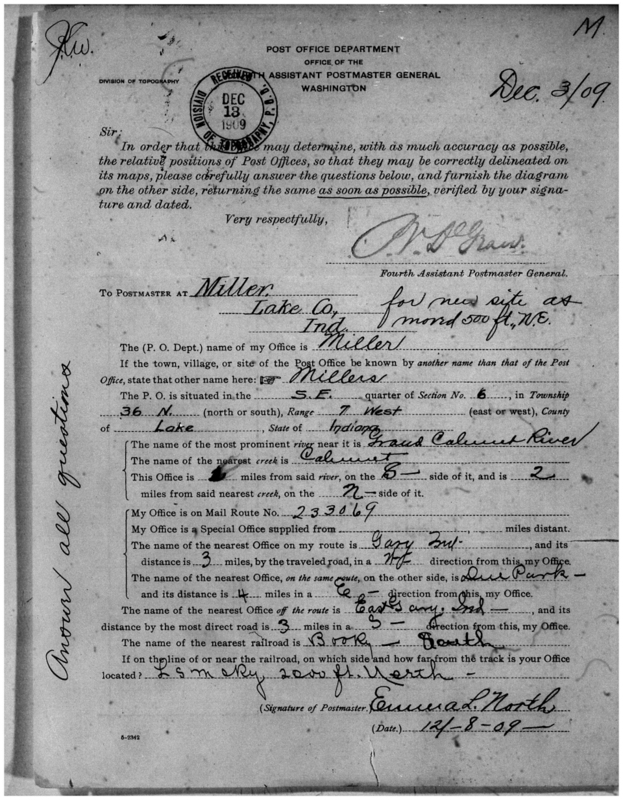 At the right are the postmaster appointments for Miller from 1900 on. Click to enlarge. 1879 W. G. Cook …………..
W.G. Cook – 8 Feb 1871 –Name changed to Vanderbilt 8 Sept 1874 – back to Miller’s Station 13 June 1879. Lena M. Anderson 12 Dec 1924 Postmaster until Miller became a sub-station in 1927. She would continue as the sub-station's clerk for about a decade. Anyone researching a family using the censuses of 1920 and earlier is likely to get confused by the street names in the censuses. That’s because the street names were changed, and addresses assigned to houses, sometime between 1923 and 1925. As evidence, in the 1923 city directory William Westergren is listed as living on the east side of Osterman. In 1925 his address is 611 S. Howard. Gary city directories exist from 1908 to 1975 but with some significant gaps notably in the early 1930s and the war years of 1941-1944. Ancestry.com has them online to 1960 almost complete. They are complete at the Lake County Library and the Calumet Regional Archives. The 1920 directory, the first to list Miller residents, only indicates what street someone lived on. The 1922 and 1923 directories at least indicate what side of the street a Miller resident lived. Miller was not included in the street guide until 1925. 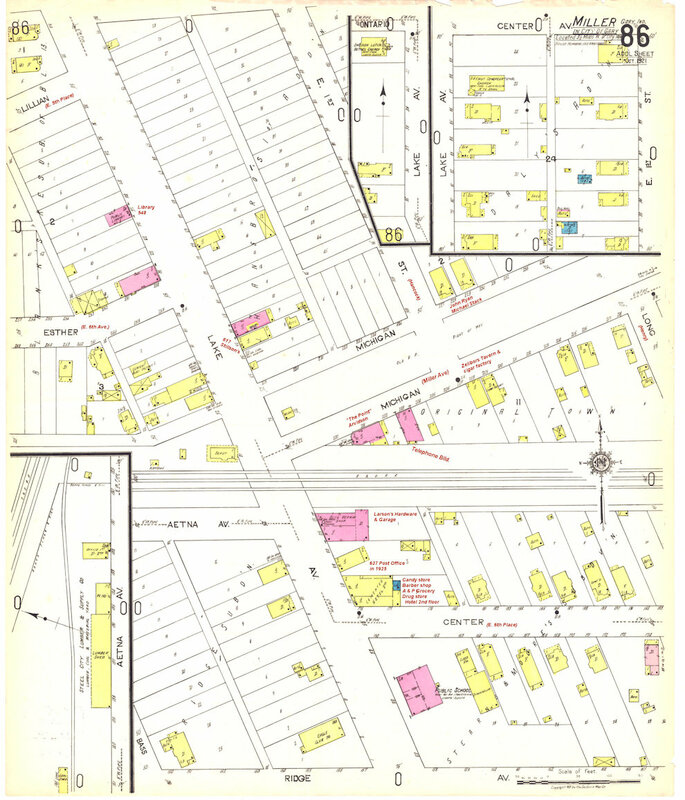 The following list of name changes was gleaned from primarily the 1921 Sanborn Fire Insurance Map (below) with help from the City Directories, the 1920 census, and a 1918 B&O RR track map in Miller. Howard St. was Osterman St.
Huntington St. was Hanna Street. Henry Street was Long Street. Hancock was E. 1st Street. Miller Ave. was Michigan St. (Aetna Street west of Lake Street.) Also called “Main Street” on the 1910 census. E. 4th Ave was Ontario. E. 5th Place (south of Fifth-Third Bank) was Lillian Ave.
E. 6th Ave (south of old Ming Ling, not be confused with 6th Place.) was Esther. E. 6th Place (between Chase Bank and old Miller School) was Center Street, and “Swede Ave.” on the 1920 census. U.S. 12 or Dunes Highway was called Ridge Ave on the Sanborn map. Dunes Highway wouldn't be built for a few years. The red colored buildings on the Sanborn map indicate brick structures. This photo, used in Linda Simon and Jane Ammeson's Miller Beach is quite instructive. Taken shortly before Lake Street was paved in 1922-1923, it shows Stillson's at 617 Lake Street. When enlarged note the sign pointing right to Michigan City down Miller Ave., and the signs on the left pointing to Carr's Beach (Dancing) and the "Gary Municipal Beach." Thanks to Tanis Pawson, Patrick Ryan, and Steve McShane at the Calumet Archives for photos. And also to the librarians at the Lake County Library. Location Reports: P.O. 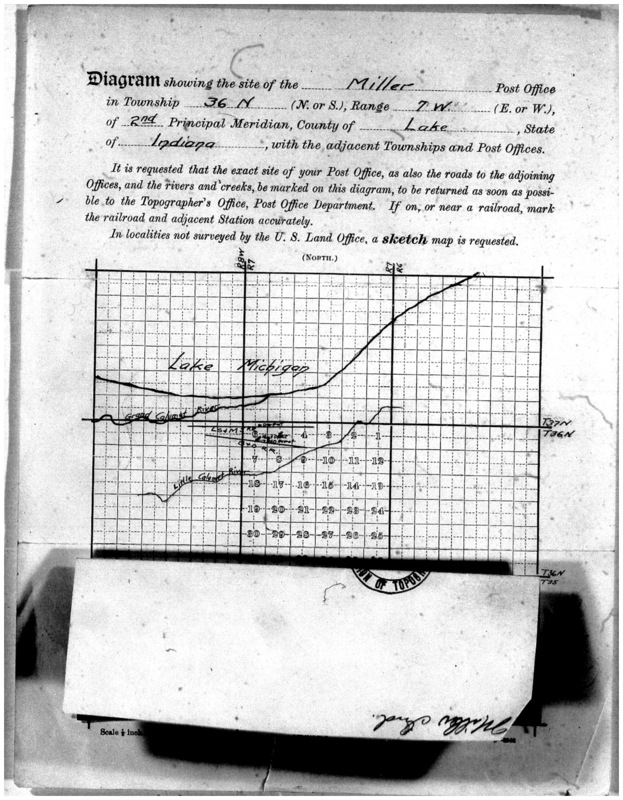 Reports of Site Locations, 1837 – 1950; National Archives and Records Administration (Chicago); Record Group 28, Microfilm Publication M1126, Roll 164. 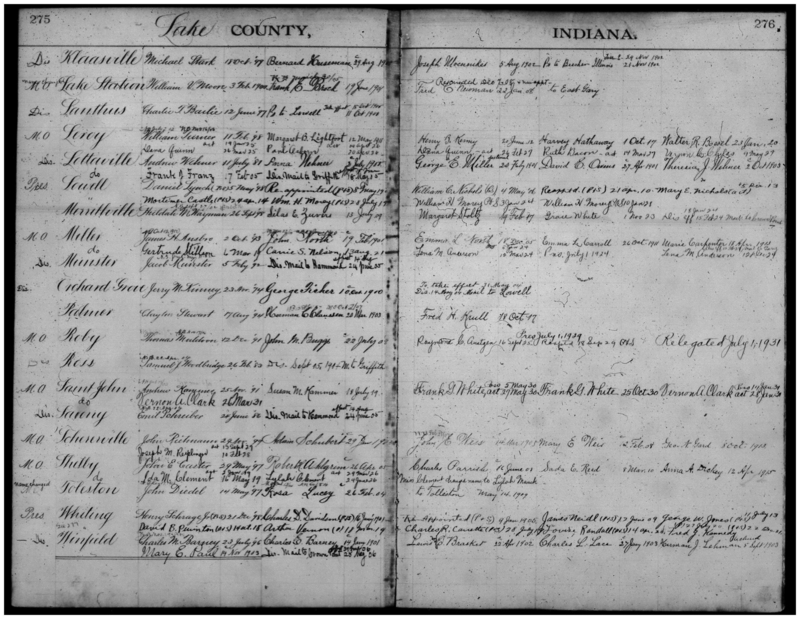 Record of Appointment of Postmasters, 1814-1971; National Archives and Records Administration (Chicago), Record Group 28, Microfilm Publication M841, Roll 34, Indiana Lake-Putnam Counties. Also available at Ancestry.com. Ancestry.com. U.S., Register of Civil, Military, and Naval Service, 1863-1959[database on-line]. Provo, UT, USA: Ancestry.com Operations, Inc., 2014. Original data: Department of Commerce and Labor, Bureau of the Census. Official Register of the United States, Containing a List of the Officers and Employees in the Civil, Military, and Naval Service. Digitized books (77 volumes). Oregon State Library, Salem, Oregon. A Virtual Cemetery of Miller Postmasters named on this page lacking only the first two, William Enos and Henry Noe. The Smithsonian's National Postal Museum And a special thanks to Baasil Wilder there who answered a question about route numbers for me.